Display is 12 digits, green vacuum-fluorescent tubes. Main integrated circuits - Six medium scale integrated circuits by American Micro-systems Inc. (AMI), date coded about week 42 of 1970. 240 x 278 x 104 mm (9.5" x 11" x 4"). Advertising brochure for the Ricomac 1200. "With LSI" [Large-Scale Integration], though requiring six integrated circuits in the chipset this is what would now be described as MSI [Medium-Scale Integration]. View from the rear showing the two main circuit boards below the power supply section. The two circuit boards removed. 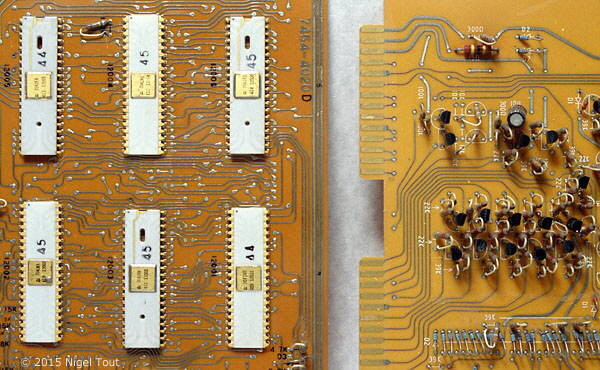 Close up of the AMI calculator chip set, numbered 409 12001, 410 12002, 411 12003, 412 12004, 413 12005, 414 12006, all date coded to late 1970. 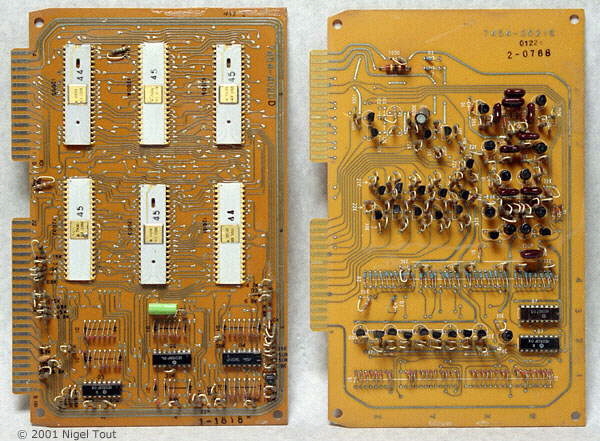 On the right are some of the discrete transistors and diodes of the other board. 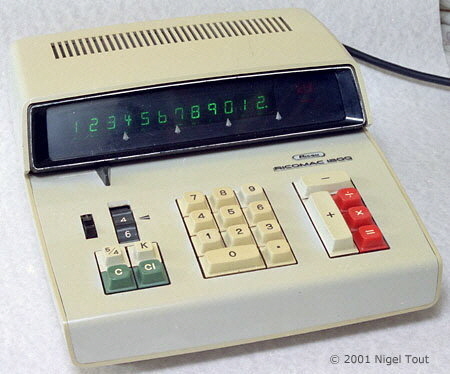 Ricoh are well known camera and office equipement manufacturers who produced a small number of models of mechanical (see below), desk electronic, and hand-held electronic calculator variously in the period from the late 1960s to the early 1970s. Founded in 1936 as Riken Kankoshi Co., Ltd. to make and sell photographic materials, it changed its name to Riken Optical Co., Ltd in 1938. In the 1960s the comapny developed rapidly and became Ricoh Co. Ltd. in 1963. 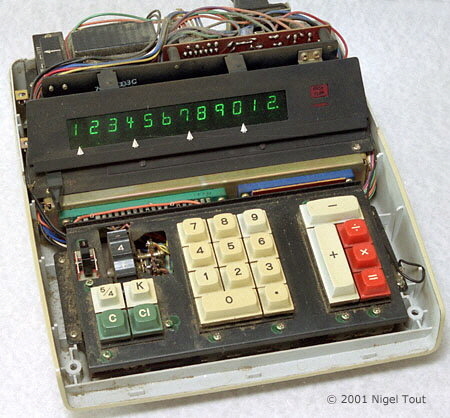 It is still in business today and is a major manufacturer of office automation equipment. 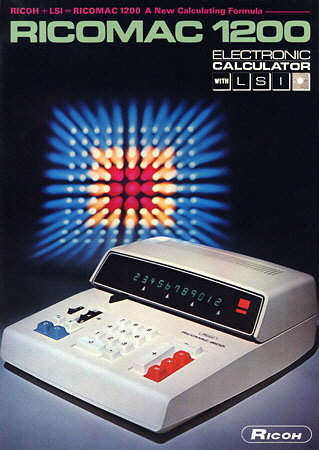 In the UK Ricoh calculators were distributed by Decimo. 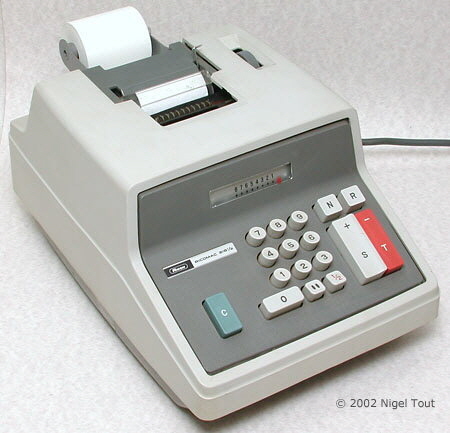 Ricoh Ricomac 218 ½, electrically powered, mechanical, ten-key add-lister.